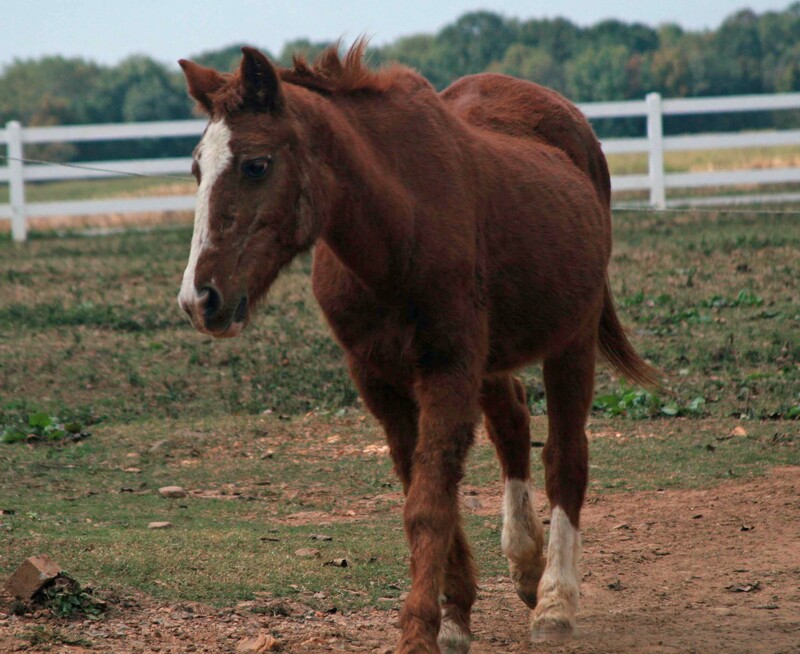 Rescued August 16, 2013 Memphis is another horse rescued by Iredell County. As bad as she looks in her before photo, she was even worse when relinquished to animal control. She was cared for and fed by animal control for about a week before we had an opening for her in our field reserved for in-coming horses. 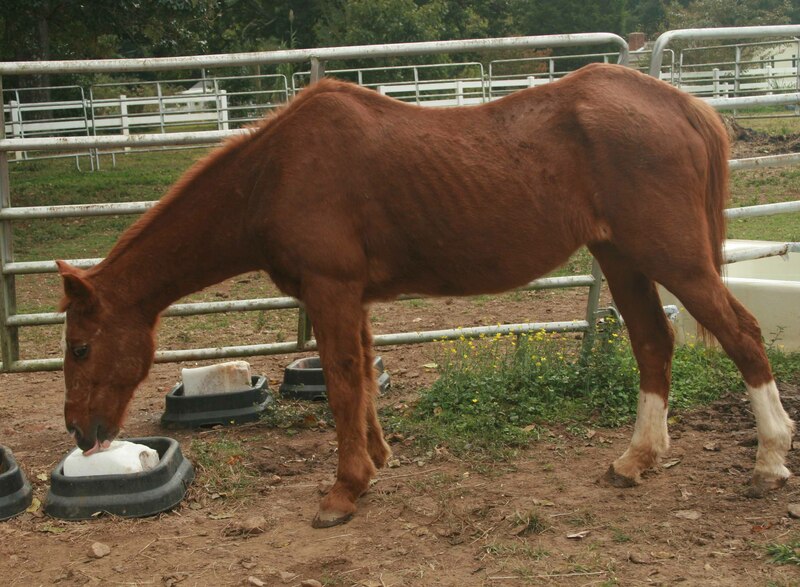 August of 2013 was a very busy month with 5 horses rescued and more to come in September! It is very difficult to put together the stories of the horses. Previous owners are not always truthful and may have many versions that are told to us and various animal control agents. The agents were told that Memphis was 19 years old and that she had been given to them to use as a therapy horse for an epileptic child. The horse arrived completely tacked and they did not know she was thin until they removed the saddle and numerous saddle pads. It is not clear whether she was ever ridden by the child. The family said they had been trying for a year to put weight on the little horse with no success. 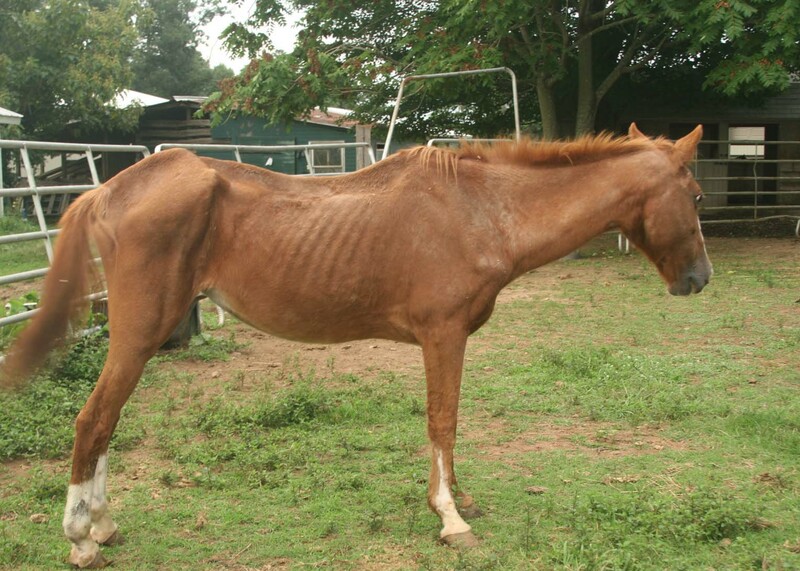 They had never sought the help of a vet or a rescue to find out how to help the horse gain weight. Instead, they said they had tried natural remedies. Did they not know the best remedy to starvation was FOOD?. Other horses in good condition were also on the property but it is not known how long the family had been in possession of these. Animal control left the others to be monitored and seized the little mare. The little mare is actually closer to 28-years-old though she looks younger due to her petite build, childish whinny and short tail. She has gained weight with no problem as she is on free choice hay, soaked alfalfa, probiotics, vitamins & minerals, and a quality pelleted feed that is 13% protein. After 2 months in our rehabilitation field, she is now stronger enough to join our old lady herd with her companions Bandalero and Miwok.